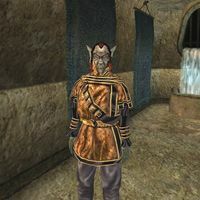 Elo Arethan is a Dunmer savant who can be found in the waistworks of Vivec's Hlaalu Canton. He offers minor training in Mercantile, Speechcraft, and Athletics, as well as a small selection of books for sale. He wears an extravagant shirt with matching belt, pants, and shoes and he carries a dire vipersword. Aside from his natural resistance to fire and the sanctuary provided by his ancestors, he knows no spells. This page was last modified on 24 March 2015, at 18:45.